"Kisses Sweeter Than Wine" is a verse from the biblical Song of Songs of Solomon. Marcello Maloberti chose it as the title for the small “garden of delights” he created on the terraces of Centro Zegna, his first permanent public work. “I chose a title that would evoke an image, an atmosphere: the sweetness and joy of being together”. 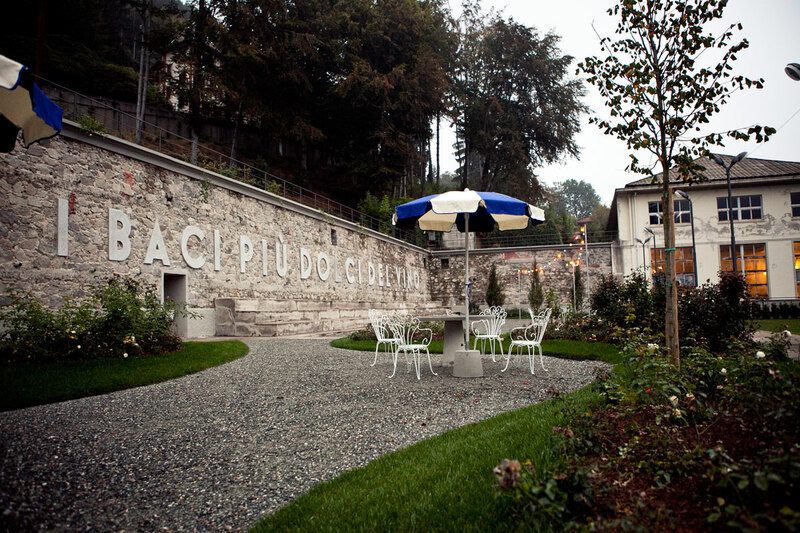 Located between the public swimming pool and gym hall, "Kisses Sweeter Than Wine" occupies the previously neglected area of the old bocce courts: a familiar place for many inhabitants of Trivero. This location was suggested by the members of local associations (Associazione Delfino, Delegazione degli Alpini di Trivero, Comitato Festeggiamenti Pratrivero, Corale Aurora Montis, Società Ginnastica La Marmora) with whom the artist collaborated on the garden, as well as on the collective performance that celebrated its inauguration. Maloberti involved in the project also the students and teachers of the primary schools of Ronco. The garden comprises several elements. The most visible element is a monumental writing on the wall (over 30 metre long), spelling out in concrete the work’s title. The most charming is a rose garden with fifteen varieties of fragrant white flowers. Furthermore, there are ornamental fruit trees; a set of tables designed by the artist; a fragment of a stage and a half-moon neon sign, “to wish the town a peaceful night”, says Maloberti. For the setting up of the garden, Maloberti collaborated with Marco Nieri, expert in bioenergetics, in order to create a pleasant environment that also features plants - hornbeams, limes, apple trees - with a healthy impact on the organism.